Here at Notre Dame, we are very excited to announce the re-establishment of our Alumni Association. We are creating a central Association that will culminate all three institutions that have built Notre Dame as it stands today – St. Francis de Sales, Utica Catholic Academy, and Notre Dame. Although in their solitary existences each institution has traditions of their own, all graduates and attendees will be members of this unified fee-free association. We have already begun work with leadership roles in this Alumni Association, but there are still positions that need to be filled. If you are interested in assisting us in this endeavor and reconnecting with classmates, please be sure to contact us. We are planning our first Alumni Association Board Meeting in the later winter of 2019. 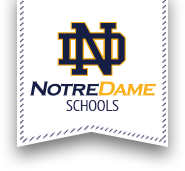 There has been so much occurring at Notre Dame with our students, faculty, and staff – sports, new class availabilities, technology improvements, and faculty additions to name a few. With the re-creation of the Alumni Association, I came to Notre Dame as the Director of Development. As an alumnus/a, if you have any questions or concerns about this Association, planning your reunion, or future plans for Notre Dame, you can contact me at khartman@syrdiocese.org or 315-724-5118. Promote the growth and development of Notre Dame to alumni, creating opportunities for them to give back to their alma mater as an individual and a group. Reconnect classmates, fellow alumni, and the school. Create networking and relationship building for all, especially young alumni. I am very excited to work with the alumni of this fantastic institution that has been reinforcing values I received in my education and in my home. I’m looking forward to hearing from many of you and working alongside of you to bring you and your old friends back together!